Cover Reveal ~ Weeping Dark: Bleeding Edge! Presenting – the cover art to Weeping Dark: Bleeding Edge! 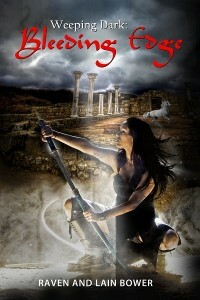 Our new epic fantasy novel that kicks off a sweeping series! Featured on the cover is the blood mage, Keirce. When a rash of brutal murders target the most defenseless of her people, spunky captain Shayla Dormyr is determined to bring the culprits to justice. Defying the command of the Prima Canticle, who claim jurisdiction over the ritually slain children, Shayla embarks on a rebellious mission that could cost her rank and freedom. When she unwittingly exposes a Blood Rune to her prime suspect, the troublesome sell-sword Daibryn, it unleashes arcane consequences that renders them vulnerable to an ambitious and cruel Blood Mage. Shayla and Daibryn embark on an adventure that will take them to worlds far larger than they ever imagined where love, hate and mystery put their souls to the test. I am really looking forward to reading the book. Great cover.